Self-adhesive and over-laminated pipe identification tapes for Internal and External use. This section includes a full range of text tapes and coloured pipe ID tapes for Air, Water, Gases, Acids & Alkalis, other chemicals, Oils, Steam, Heating, Plumbing and Fire. Use the 50mm, 100mm and 150mm wide coloured tapes to create your full banding requirements on pipework and add the text tapes to show the pipe contents. Use the directional arrow tapes to show the direction of flow. New - we have now added 275mm wide tapes for internal and external use. 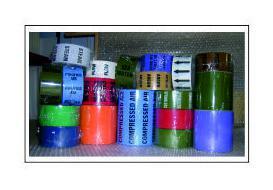 The tapes are suitable for applying directly to pipework or over lagging. Clear acrylic tape can also be purchased to go over the tapes for additional protection. Internal and External Pipeline ID tapes are also made to order, please contact us with your requirements and we would be happy to provide a quotation. 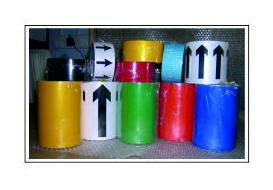 Self-adhesive and over-laminated pipe identification tapes for Internal use. Browse this section to find pipe ID tapes for Air, Water, Gases, Acids & Alkalis, other chemicals, Oils, Steam Heating, Plumbing and Fire. You will find 50mm, 100mm and 150mm wide coloured tapes, tapes with descriptive text and directional arrow tapes, and we have now added the new 275mm wide tapes. All rolls of internal tapes are 33m long and conform BS1710:2014 and BS4800:2011.